Tour 07: Are you ready for something New? 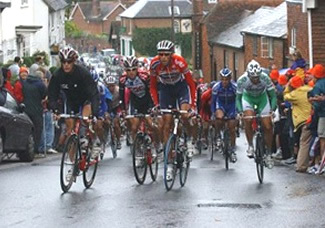 Much has been written about the opening events of the 2007 Tour de France. 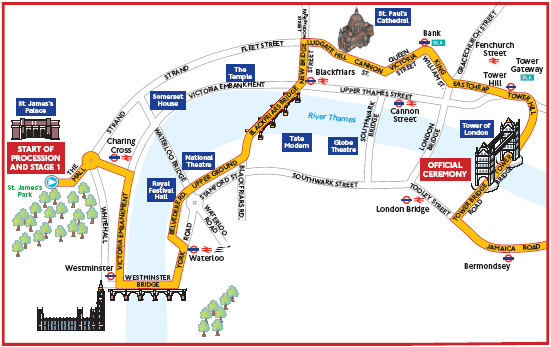 London will host the Prologue Individual Time Trial and Stage 1 will start in London and finish in Canterbury . The Prologue will be a spectacular affair passing some of the most famous city landmarks in the world and finishing literally on the Queen's doorstep at Buckingham Palace on The Mall. Most readers will be familiar with London 's great sights but few will be so familiar with the Stage1 route between London and Canterbury. The stage itself will start as a very long ‘neutral zone procession' to get the riders and race convoy through the city streets and southeastern suburbs and out into the open countryside of the county of Kent . Starting in St. James's Park (just behind Buckingham Palace ) the Tour will pass the Palace, go up the Mall, pass under Admiralty Arch and then past Lord Nelson standing triumphantly on his column in Trafalgar Square . From there the riders will go down the Victoria Embankment alongside the River Thames and then turn left (past the brooding statue of Sir Winston Churchill) to go over Westminster Bridge with Big Ben and the Houses of Parliament to their right. Over the bridge a left turn sends the race back along the Thames to pass St. Paul 's Cathedral and then on to Tower Hill (the site of many famous public executions between the 16th and 18th Centuries) and around the incomparable Tower of London sitting beside the Thames. Passing around The Tower the road again crosses the Thames over yet another famous landmark, Tower Bridge . Here the entire Tour entourage will pause for an official ‘send off' ceremony. However this is still not the race start! 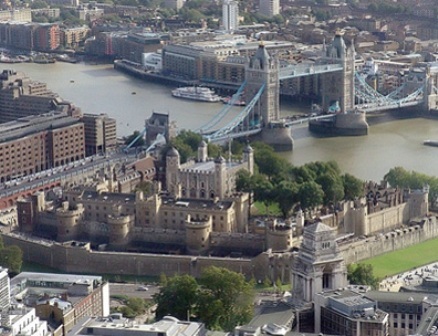 Once over Tower Bridge the race (procession) will pass through South East London to the official start in Greenwich . By now about 15kms will have been covered. Km 0. Official race start ‘on time'! 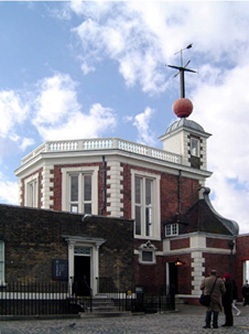 The red time ball on the roof of the Royal Observatory in Greenwich drops each day at 1:00pm to set world time. It has done this every day since 1833. The stretch from Greenwich (Km 0, official race start) to Strood (about 40kms) is one of the least enticing parts of England . 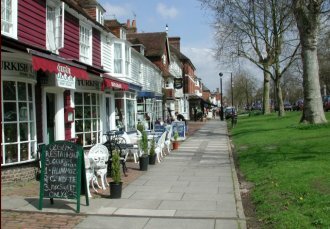 I was born and spent my early childhood in this area and it was not until we moved down to Maidstone in Kent when I was 15 that I realized just how unattractive London 's South East suburbs were! Just after Strood the race passes under the River Medway through the road tunnel (which prohibits cyclists at all other times). This crossing should present an interesting spectacle because shortly after emerging from the tunnel the very first Hot Spot sprint (Medway at 47kms) comes at Gillingham. 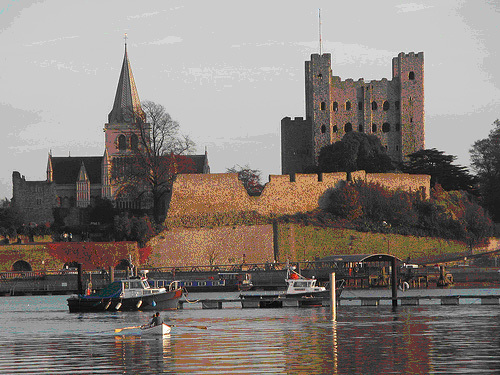 The race then swings right and curves back to Rochester famous for its Norman castle and ancient Cathedral. Last year the Tour of Britain saw Stage 5 start here and end in Canterbury in what was really a ‘dress rehearsal' for Le Tour as it covered the same roads through Kent . Tom Boonen was riding the race that day but it was his teammate Francesco Chicchi who won the bunch sprint into Canterbury. The stakes are somewhat higher in the Tour and with Tom knowing the Kent roads he could well claim the Stage 1 victory. The race is now well and truly in Kent and, after a long and modest uphill drag out of Rochester, the grim suburban architecture of London gives way to beautiful countryside. 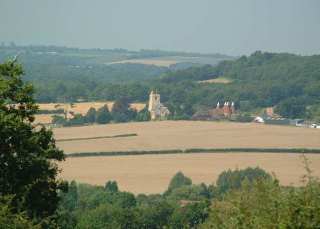 The first experience for the riders will be the road that skirts alongside the North Downs with tremendous views right across the Medway valley. Along the way they will pass through the small village of Burham which straddles the ancient Pilgrim's Way (from London to Canterbury ). 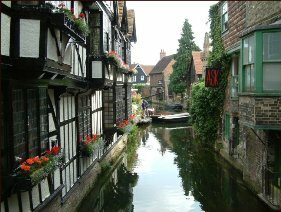 This ‘road' was the center piece of Geoffrey Chaucer's (14th Century) The Canterbury Tales which immortalized a motley band of pilgrims making their way to Canterbury from London. 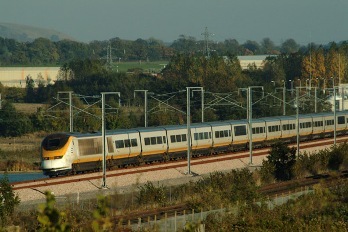 From Burham the run in to Maidstone (67km) crosses the M20 motorway and the Eurostar high speed rail link to the Kent coast (and from there through the channel tunnel to France ). Maidstone is the ‘County Town' (administrative center) for Kent and the race will pass right by ‘County Hall' with the forbidding Maidstone prison right behind it. This old prison is surrounded by a 30 foot high ragstone wall and in its time has housed some of Britain 's most notorious villains. The race will bear right at the prison and swoop down to the River Medway and over the town bridge to head up the Tonbridge Road . Here a long steady drag goes up for about 4 km past drab houses (and my old High School) before emerging into the countryside. Most average cyclists would feel this ascent but for the Tour riders this will be a ‘big ring job'. they will see the well preserved 14th Century ‘Archbishop's Palace. A year ago while visiting my mother in Maidstone (I now live in the USA ) I was amazed to see the local newspaper coverage that the Tour was already receiving. Road closures and narrative to build excitement were already making the locals aware of the impending big day. 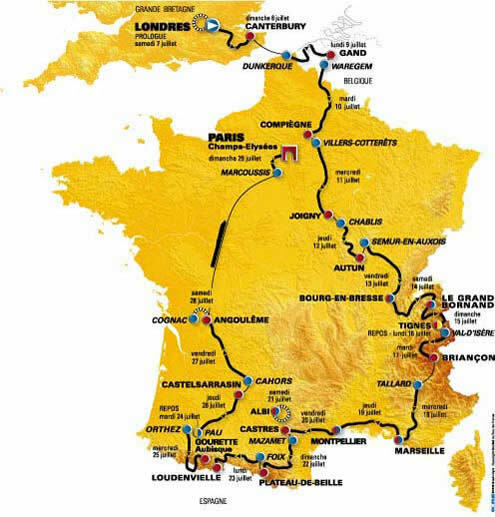 Having researched many of the towns on this Stage 1 route it was interesting to learn that local town councils all along the route had formed TdF committees and created special features on their town web sites. If the ‘conditioning' of the general public works then expect to see huge road side crowds for the entire day. Sadly the nature of open road racing like the Tour usually only provides a brief but very intense experience to the viewing public. From when the race passes Maidstone 's County Hall until it disappears out of the other side of town up the Tonbridge Road it will be all of ten minutes at most. And of the thousands that will turn out very few of them will actually understand how the race functions. Nearly everyone knows the Yellow Jersey but few of the general public know how it is earned. No matter, the anticipation, the road side parties, the Tour's advertising convoy, the TV helicopters, the peloton itself and then the endless stream of support vehicles is always an awesome experience. Most of the people in Maisdtone (and countless other towns and villages along the way) will not know (or care) who won the stage in Canterbury! Having climbed out of Maidstone the road follows the River Medaway which here is set in a classic idyllic English countryside scene. To the riders left fields descend to the river which every few miles is crossed by an ancient bridge. 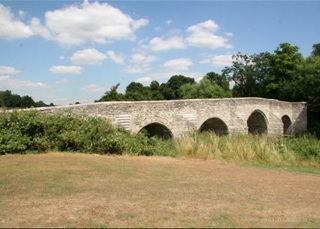 The first comes at East Farleigh with its perfectly preserved 14th bridge. Although totally unsuitable for modern day traffic, cars squeeze over it daily. During England's civil war in June of 1648 Oliver Cromwell's forces led by General Fairfax crossed this bridge in a big sweeping manouver, descended on Maidstone, killed hundreds of Royalists and then moved on to Rochester and then London. 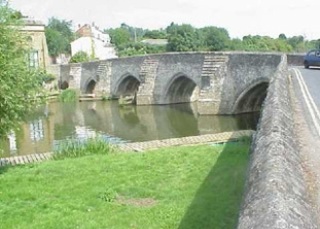 Teston (and its ancient bridge) comes just after East Farleigh and it is here that the bunch will contest Hot Spot sprint number 2. The stage will have now covered 76km. The Tour is now in the “Weald of Kent”. 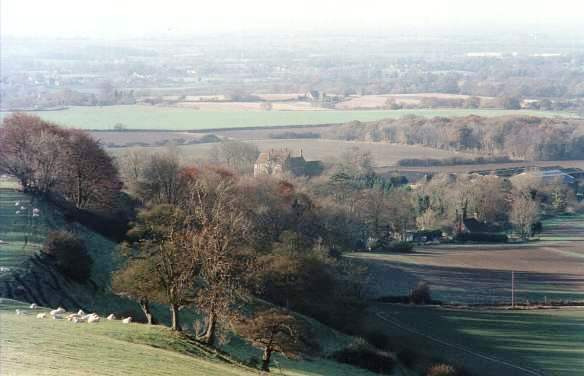 Weald is an old word for forest and in Roman times and medeival times the center of Kent was a densly forested area with iron smelting as one of the main industries. 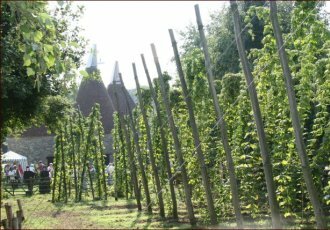 There is little evidence of forests or an iron industry today as modern Kent reflects its often used moniker of ‘The Garden of England' with farming, and up until the 1960's hop farming in particular, dominating the landscape. 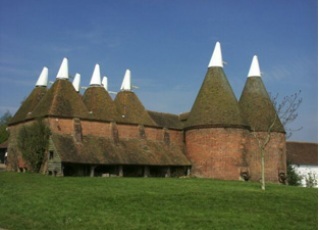 Memories of the hop farming industry will be seen frequently by the Tour bunch as they pass the distinctive Oast Houses which are round buildings with conical roofs. These were used to dry the hops in preparation for the beer brewing process. Today these buildings are greatly valued and adapted into beautiful homes. 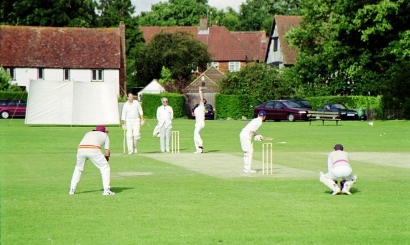 Hopfields (left) were once a common site in Kent. Happily excellent country pubs (right) are still to be found in profusion! “Apparently Quarry Hill will be one of the first "mountains" that will qualify Tour de France riders to be King of the Mountains! This has to be some sort of joke surely; I know it can get you a bit out of puff on a mountain bike on a hot summer's day, but these guys are super human aren't they? Km 94. Hardly the image of a Tour climb but Quarry Hill at Tonbridge is rated Cat 4. 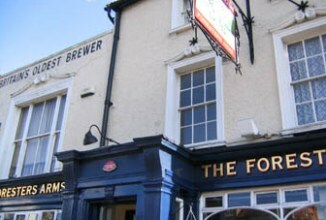 The Foresters Arms on Quarry Hill has satellite TV. 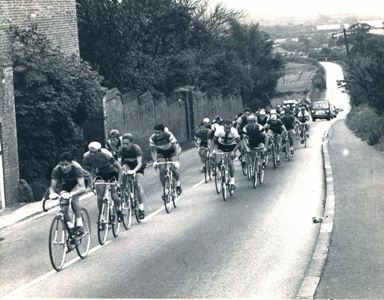 You can wait for the Tour here watching the race while supping a pint; nip outside as the race passes and then watch the rest of the stage with "liquid comfort"
Three kilometers after the climb of Quarry Hill it's feeding time for the bunch as they descend on Royal Tunbridge Wells. This town is a genteel place that exudes old English elegance. ‘Royal' was added to the town name during Georgian times (1714 to 1830) when it became popular as a spa town and gained a reputation as the place to see and be seen amongst royalty and fashionable members of the aristocracy. 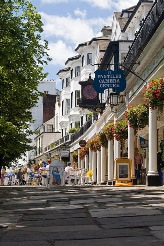 Today the ‘Pantiles' in the center of town remain as one of the most beautiful town promenade areas in England where one takes afternoon tea and cake. For cyclists Royal Tunbridge Wells is home to our own royalty for it is here that the great Sean Yates lives. As the race now turns east the Tour riders will quickly learn that Yatesey had some tough training roads to work with. For while this part of England may not have mountains the frequency of short and often steep ascents can certainly give you a good workout. 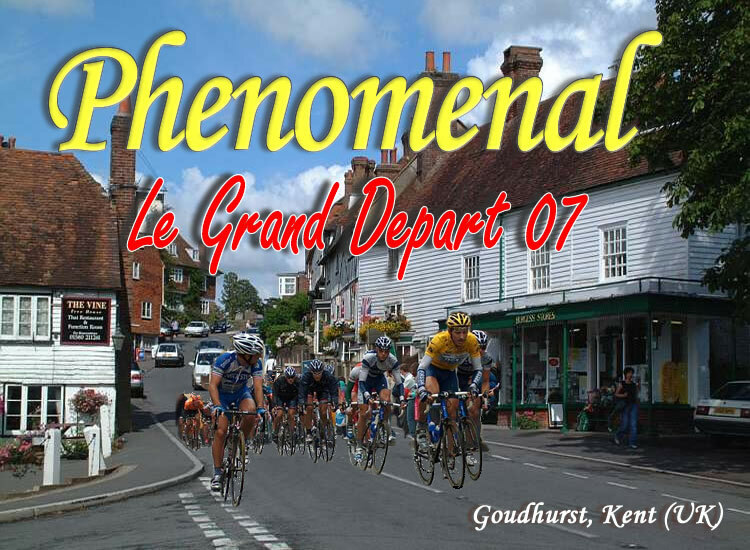 About 20kms after Tunbridge Wells the second KOM comes at Goudhurst village. At 11% this climb has the potential to give break away artists a chance to escape. But if the bunch is cruising along they will certainly enjoy this small picturesque village and its surroundings. Km 121. 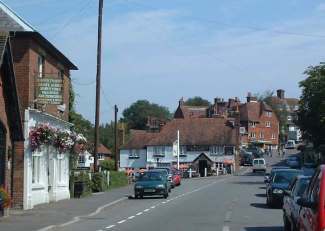 Peaceful Goudhurst will witness the second KOM sprint on the hill that passes through the village. 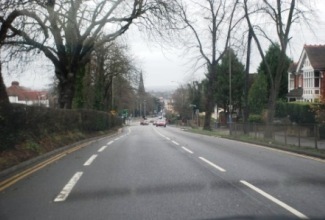 The race is now on roads where I first learnt to train and race back in the 1960's. Every Wednesday the chain gang would hurtle through the next few villages; Sissinghurst, Tenterden and Bethersden on a loop out from Maidstone. To see the Tour go along these same roads is quite surreal! Sissinghurst is internationally famous for the gardens created by the English author and poet Vita Sackville-West and her husband Sir Harold Nicholson. 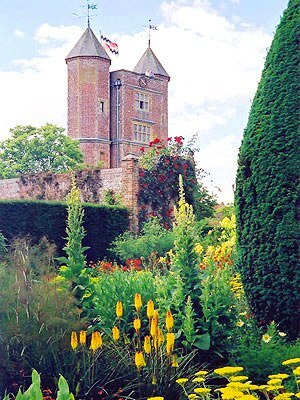 Although called Sissinghurst Castle the building and its grounds are really the remains of a Tudor mansion. 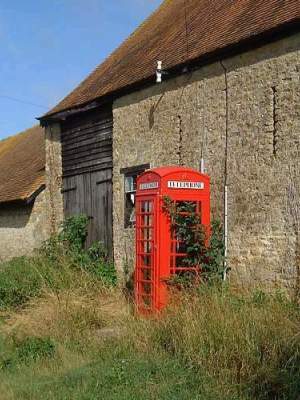 Who needs cell phones in Kent ?! 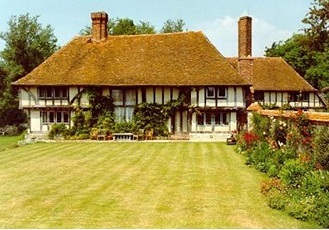 Having admired the Sissinghurst gardens the riders will quickly turn their attention to the third Hot spot sprint in Tenterden. While many casual observers will again marvel at the quiet rustic nature of this small country town, few will know that it is now a hub of Britain 's resurgent wine growing industry. Consequently it is no longer an unusual sight to see vineyards as you pass along the local country roads. But the local drink of choice is still beer as the numerous pubs dotting the stage 1 route prove. 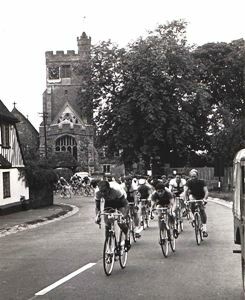 Shortly after Tenterden the race passes through Bethersden and its pub, The Bull, which bears evidence of its long association with cycling. 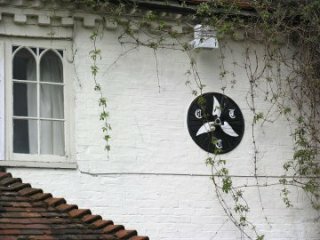 Still mounted on the building's front wall is a CTC cast iron plaque with the famous three wings logo. The CTC is the UK and Ireland 's largest and longest established national cycling membership organization. It was founded in 1878 as the Bicycle Touring Club, subsequently becoming the Cyclists' Touring Club. 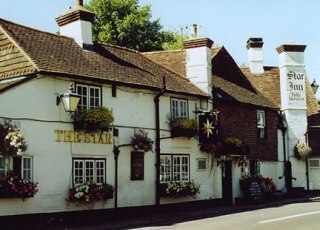 Pubs and other establishments throughout England were recognized by the CTC with a sort of Michelin Guide rating system for their food, lodging and other facilities. 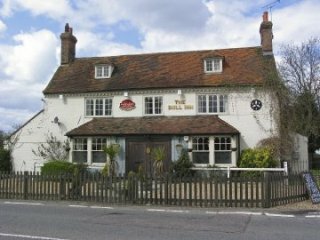 The Bull at Bethersden is still frequented by local cyclists and if you pass that way its beer and ‘pub grub' is to be highly recommended! this way don't ride past, drop in and have a pint and some great pub food! Ashford is one of the fastest growing areas in England , with rapid growth in the population and its infrastructure. Its agricultural market is one of the most important in the county but it is its location on the Eurostar rail line and on the M20 Motorway that have made this town into an important communications hub. The Tour makes a circular sweep through the town before heading back out into open country and the final leg to Canterbury. 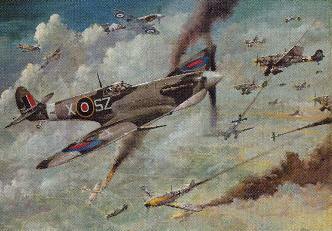 The Battle of Britain in 1940 was a pivotal event in WWII. 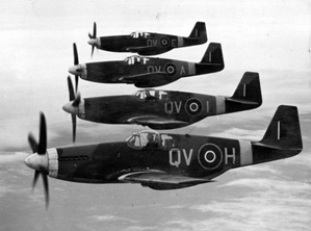 It was fought out in the skies over the Kent countryside covered by Stage 1. 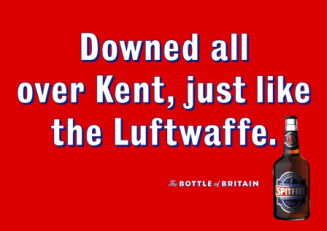 Spitfire beer remembers those historic times with not so subtle advertising! At 183kms the route provides a nasty little sting at a normally very quiet country backwater known as Farthing Corner. Here the race will encounter the 12% Hempton Hill which could provide an opportunist a perfect time to make a lone bid for Canterbury which is just 20kms further up the road. is typically short and steep (12%), a perfect springboard for an opportunist planning to outwit the sprinters. From Hempton Hill the road is arrow straight until it bears right at Hartmansole Farm with 5kms to go. 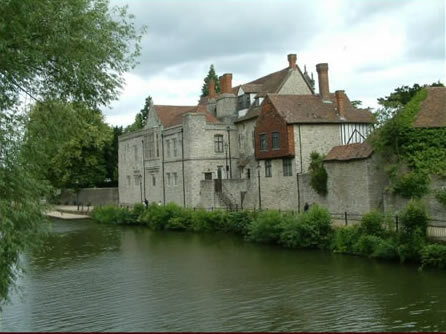 The race enters Canterbury from the east, swings around the old town periphery road (beside the original Roaman town wall) and finishes on the west side of town. Canterbury is known world wide for its famous cathedral. Although the city was severely damaged in WWII bombing raids there are still many remnants of its medieval past as well as the original Roman city wall. The cathedral itself houses the site of one of the most famous murders in history. In 1170, Thomas à Becket who was the Archbishop of Canterbury, was engaged in a serious conflict with King Henry II. Famously the King said "Who will rid me of this meddlesome priest?" A plan was concocted and four of the King's knights killed Becket in a spot near a door to the monastic cloister, the stairs into the crypt, and the stairs leading up into the quire of the cathedral, where the monks were chanting vespers. Today millions of visitors from all over the world come to visit this very spot. With the post-race presentations and media interviews completed, Le Tour will be herded on to the Eurostar high speed train to be in Dunkerque for their evening meal. From the initial receptions in London to the final sprint in Canterbury the riders and their support crews will long remember their Welcome to Kent. 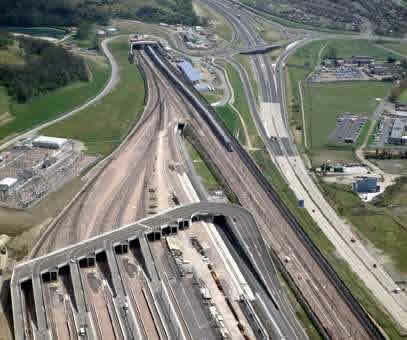 The British entrance to the Channel Tunnel, seen here, is at Cheriton, near Folkestone in Kent . One of the greatest civil engineering projects of the 20th century, the tunnel (50.4 km/31 mi long) emerges at Coquelle, near Calais , France , and is capable of carrying up to 600 trains each way daily. The Tour entourage will take the 'Eurostar' train and be 'home' in France just 35 minutes later.